KARACHI: Sindh Cabinet taking a clear cut and historic decision has cancelled illegally allotted 70,000 acres of forest land and approved vacation of 145,245 acres illegally occupied by influential. Sindh Chief Minster Sued Murad Ali Shah told the Forest department to get support of Police and Rangers for vacation of illegal occupation over an area of 145,245 acres for which he would issue necessary instructions. As far as the question of 70,000 acres illegal allotment is concerned it has been cancelled and the Revenue department and Forest department would issue cancellation orders. He was presiding over the cabinet meeting here at New Sindh secretariat on Monday. The meeting was attended by Chief Secretary Mumtaz Shah, all provincial ministers, advisors and special assistants. To a question of the chair, Minister Forest Syed Nasir Shah said that 13,000 acres have been retrieved from the illegal occupants and action was being taken for retrieval of the remaining land. AT this the chief minister directed him to start operation against illegal occupants of the forest land for which he would provide him police and Rangers force. Compensation to Coalfield affected People: Minister Energy Imtiaz Shaikh told the cabinet that 757 families inhabing in one kilometer radius of Gorano Dam and Dukkur Chho pond should be considered as affected people apart from those 471 who have been displaced due to development/excavation of Thar Coalfield Block-II. The chief minister said that these affected people have every right to be compensated. The cabinet approved Rs900 million as donation for Thar Foundation which would be giving Rs100,000 annually to each and every affected family for the next 30 years. The Thar Foundation would invest the amount and start paying compensation to the affected people of Gorano and Dukkur Chho. The cabinet also approved a compsation of Rs100,000 to 471 affected families of Thar Block-II. This compensation would be paid by Sindh Engro Coal Mining Company because they were lease holders. These 471 families are also being provided one house in two different villages, Senhri Dars and Tharyo Halepoto. Installation of Meters: Energy Minister Imtiaz Shaikh also presented an item in the cabinet for extension in completion period for Automatic Meters Reading (AMR) system by Heco and Sepco. 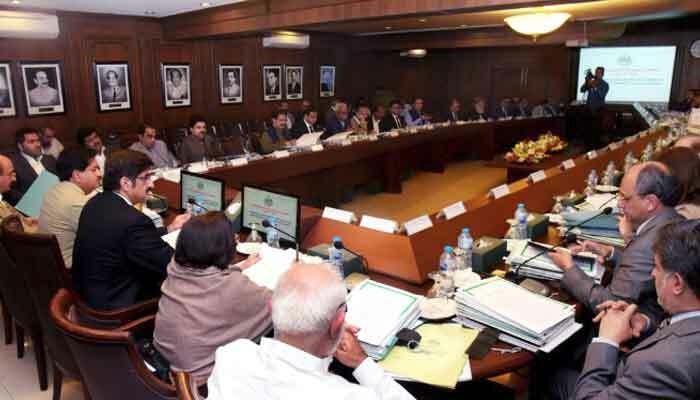 The cabinet was told that the Sindh government under an agreement paid Rs27.398 billion to Discos (Hesco Rs10.228 billion and Sepco Rs17.170 billion) to clear all outstanding electricity dues for the period from July 2010-2016. In addition monthly agreed amount was also agreed to be paid to Hesco Rs555.82 million and Rs513.73 million to Sepco till installation of AMR meters. The meeting was also told that Rs26.738 billion has been paid to Discos, Hesco Rs12.843 billion and Sepco 13.895 billion for the period from August 2016 to August 2018. Minister Energy also told the meeting that it was also agreed that Discos would install AMR system and the provincial government would bear 50 percent of the total cost. For the purpose the Sindh government has already paid Rs170.382 million to Hesco and Rs211.002 million to Sepco but installation of AMR meters have not been made so far. Therefore, monthly electricity bills of both the Discos could be stopped. On the intervnstion of the chief minister the cabinet approved extension of time to Discos to install meters by May 2019 and also released monthly payments of Rs513.73 million to Hesco and Rs555.82 million to Sepco till transferring of billing to AMR system. Sugarcane Price: Agriculture Minister Ismail Rahu told the cabinet that the growers were demanding to increase purchase price of sugarcane as it was stagnant from the last three years at Rs182 per 40 kg. He added that the government of Punjab has already fixed sugarcane price at Rs180, therefore he recommended that the price should not be lower than Rs182 per maund. He also said that the PSMA representatives were of the view that the price of sugar has come down to Rs48 per kg in the market. The cabinet after thorough discussion approved fixation of minimum sugarcane price at Rs182 per 40 kg. The cabinet also approved to authorize Agriculture Minister to appoint Market Committees on his own and inform the cabinet. Qingqi/Chingchi Fare: The Transport department apprised the cabinet that there was no minimum or maximum fare of Chingchi/Motorcycle rickshaw fares. Therefore, the proposed two fare slabs: from 0 to 6 kilometers Rs10 and above Rs15 per passenger. The cabinet approved the fare. The chief minister directed transport department to ensure proper safety precautions in the said rickshaws and also register them. “Why their registration has been delayed,” he questioned. Minister Excise Mukesh Chawla told the chief minister that their registration process was being started. There are six residential colonies of the provincial government in Karachi. The colony for officers of grade PBS-18 and above, out of 145 residences, only 12 are against the policy. For grade PBS-17 and above, out of 12 (two rooms) suits three are against the policy. For grade 11, out of 12 flats only three are against the policy. For grade BPS-17 (garden west) officers, out of 48 accommodations only 23 are against the policy. For Grade BPS-11 to16 officials accommodation at GOR-II, out of 222 flats (two rooms) for ministerial staff 80 are against the policy. For officials of Grade B-1 to 11 GoR-III, Shadman Town there are 182 flats (two rooms) of them 121 are against the policy. At GOR Landhi there are 333 flats and nine are against the policy. The cabinet discussed the allotments status and said that the forcibly vacation of the accommodation from those who were residing there against the policy would be ethically wrong. Therefore, the cabinet approved one-time waver for the present allottees and till their retirement they would be entitled to stay there, however no allotment against the policy would be made onward. The chief minister directed Chief Secretary to get inspection of each and every flat if any outsider was not living there. “This is unacceptable and I would not allow misuse of government residences,” he said. Recruitments approved: The Service & General Administration department presented an item to seek permission for starting recruitment for the posts in grade BSP-1 to BSP-15. The chief minister said that these recruitments would be made purely on merit. The guideline is to publish advertisements in the national newspapers and then make selection committees. He also said in lower grades only local be recruited, however there would a 5percent quota for disabled and 5 percent for minorities. He cabinet constituted a committee under Energy Minister Imtiaz Shaikh, Advisor Law Murtaza Wahab, Secretary Services and Secretary Law to frame rules for recruitment. The cabinet also approved starting of recruitment process. He also presented another item for reconstitution of Governing Bodies of different development authorities. The cabinet authorized the local government minister to appoint the remaining members of the DHA and other authorities, where required, and report to the chief minister. The cabinet approved creation of a separate department in place Sindh Board of Investment and also approved renewal of contract of prof. Dr Abdul Qadeer Khan Rajput as chairman Charter of Inspection and Evaluation Committee. The Irrigation department presented three names, Former Secretaries Imtiaz Qazi and Idress Rajput and Engineer Abdul Basit Soomro for the position of Chairman SIDA. The cabinet was told that Mr Idress Rajput has already declined while Imtiaz Qazi who has been member of federal public service commission could not hold any other position, therefore cabinet approved appointment of Mr Basit Soomro as chairman Sindh Irrigation & Drainage Authority.